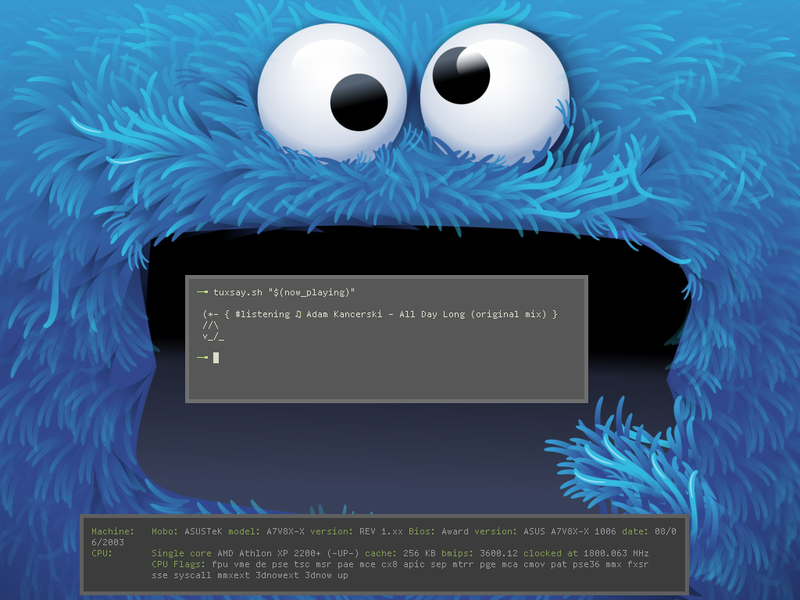 » Share your monsterwm desktop! The same rules aplly as for other screenshots topics. Share some info about bars/panels, terminals, color schemes and other things that you find interesting and relevant. At the moment, i use no bar (i plan on using dzen/somesortabar in future), my config.h and .Xresources are available on internet. Re: Share your monsterwm desktop! doesn't get detected correctly anymore and thefore runs on low resolution. So I had to post edit the screenshots a bit. Anyways, I think I've found my wm for rest of my life hopefully. Moved to monsterwm after 2or 3 years with dwm. Using dzen2 with custom bash statusbar script...which I'm contemplating switching over to conky->dzen2. New to monsterwm as well, use to only use Spectrwm but I much prefer monsterwm! Any possibility to share your configuration for the panel? Can you share your blue monster wallpaper, please? Read what you quoted. He links to it. I'm new to monsterwm too. I think I'll be sticking to dwm when I'm using a monitor - I like using tags rather than workspaces on a bigger screen - but on the netbook's dinky display monsterwm seems just about perfect. 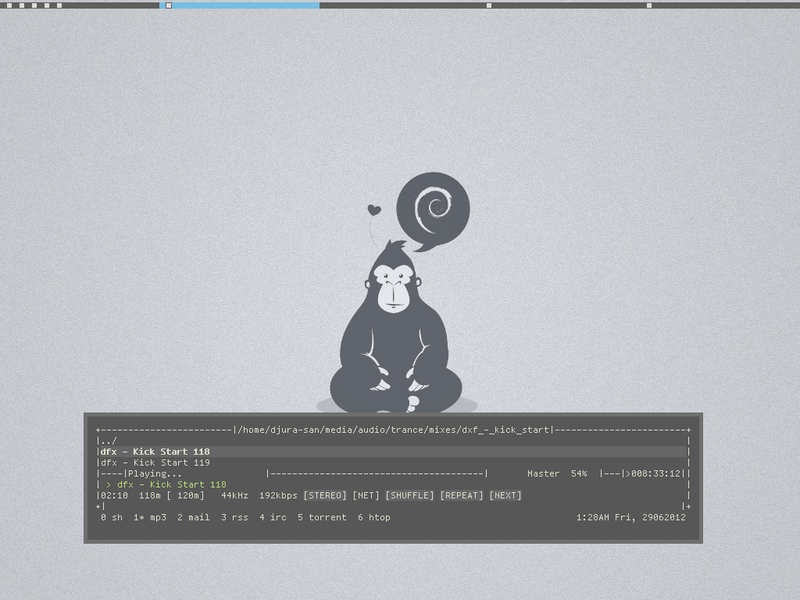 The statusbar is conky/dzen2, colourscheme courtesy of Solarized, config files for everything here. Nice work as always. I enjoyed your 30 day, 30 WM thread on #!. Thanks. I wish I could have done a better job on Awesome and Xmonad, but they were a lot to get my brain around in just a short time. Luckily they both have excellent online docs. I mostly use ratpoison these days, but this thread reminded me of how much I like monsterwm (and snapwm). 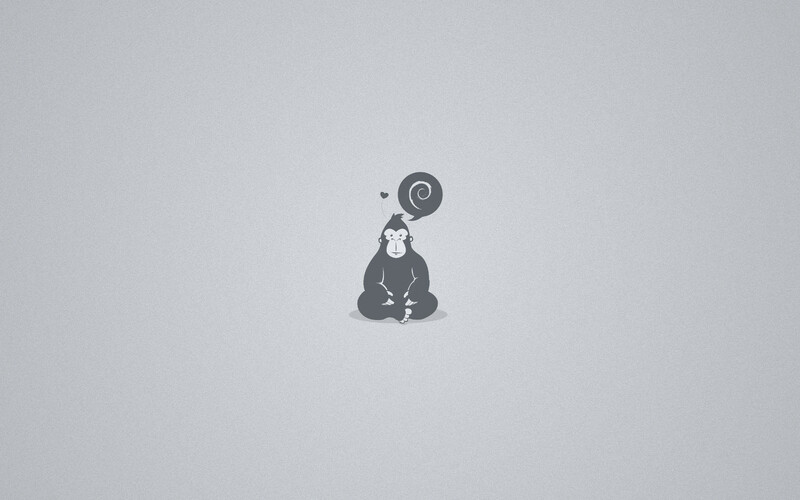 Fibonacci mode, and just a one-line conky at the top of the screen this time, no dzen2. What font is it? It looks nice! Terminus in the first scrot, Lucida Sans in the second. Terminus in the first scro. would you share those color settings ? How did you get the monster2dzen script working when I try I just get a black rectangle in the upper left hand corner. I also had to change the font to terminusmod,icons instead of terminusmod.icons to stop dzen2 from telling me it couldn't find the font could that be a problem? Nice 1, how did you get the borders that big?